Mike Murphy Unplugged teaches one man bands and creative entrepreneurs how to podcast and create online content. I teach the tools I use and love. 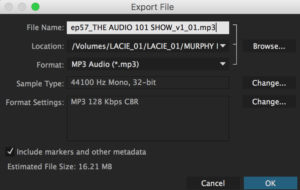 Episode 56: The Adobe Audition Show I introduced the Digital Audio Workstation, or DAW, that I use to record and edit my podcasts. This is a summary of my workflow from Episode 56. Adobe Audition is a Digital audio workstation, more commonly known in the audio world as DAW or D-A-W. Audition CC is the latest version and it is the software I use to record and edit each podcast episode. A professional audio workstation for mixing, finishing, and precision editing. Audition is used to Mix, edit, and create audio content with a comprehensive toolset that includes multitrack, waveform, and spectral display. This powerful audio workstation is designed to accelerate video production workflows and audio finishing — and deliver a polished mix with pristine sound. *Affiliate Links to benefit podcast happiness fund. Default Input: is the microphone or device going into Audition. Input…IN. What device is pumping sound into Audition? 1. Create a master folder for each episode. Inside I have two folders: Audio & Artwork (thumbnails). 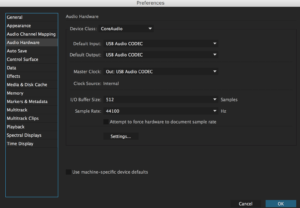 Set Default Output & Input to map to Audio Interface/Mixer. 6. Record Podcast & Save this Original File. Tip: Audition cc allows you to create templates, so for me when I create a new multitrack session, I choose the Mike template and my intro and outro are in place and I just need to add my voice track and line it up. Since my podcast is roughly the same length each week, this is about a 2 second ordeal. Use the new Audition CC Essential sound panel. Bit rate (128) will affect file size, so you may want to bump down to 96 kbps and it will reduce file size. I like the higher quality and my shows are only 15 minutes, so I keep it at 128kbps. 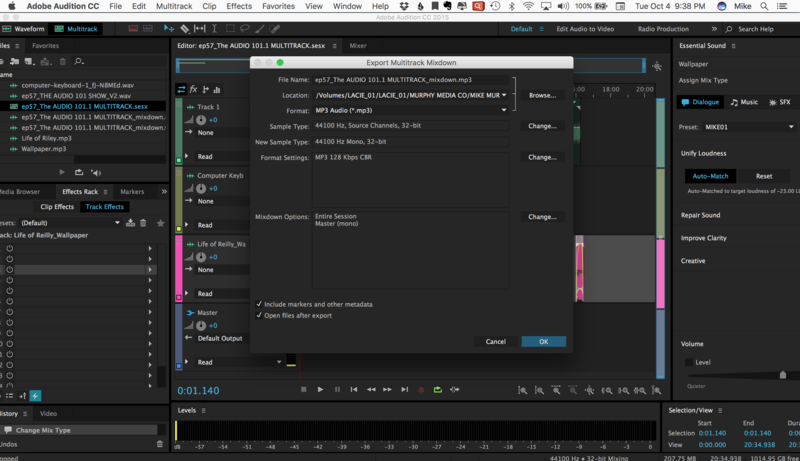 And that is the speedy version of my entire workflow in Audition. I help podcasters and content creators figure things out.